Top UC officials, including President Robert C. Dynes, joined state government representatives and leaders of Silicon Valley industry at UCSC on Friday, November 5, to dedicate and celebrate the campus's new Engineering 2 Building and the Jack Baskin Engineering Auditorium. Engineering Dean Steve Kang announced two major gifts to the engineering school at the dedication. Kumar Malavalli, a prominent leader in the data storage industry, has made a $1 million gift to establish the Kumar Malavalli Endowed Chair in Storage Systems Research (see story). Cisco Systems, a leading provider of network products and services, has donated equipment for teaching and research valued at $575,000. "With strong support from our partners, we are building 21st-century engineering," Kang said. Engineering 2 includes facilities for two California Institutes for Science and Innovation: the Institute for Quantitative Biomedical Research (QB3) and the Center for Information Technology Research in the Interest of Society (CITRIS). These multicampus research centers are supported by state funding and industry partnerships to provide the technological foundation for the state's future economic growth. "The California Institutes are increasing the state's capacity for creating new knowledge and the highly skilled workforce necessary to drive entrepreneurial business growth and expand California's economy into new industries and global markets," Dynes said prior to the dedication. Acting Chancellor Martin M. Chemers said the Engineering 2 Building, with space shared between campus divisions as well as with QB3 and CITRIS, represents UCSC's commitment to interdisciplinary education and research. Chemers said the Baskin School of Engineering reminded him of the title of a Paul Simon concert tour, "Born at the Right Time." "The engineering school came together when a new set of 21s-century technologies were emerging. We now see this fusion of information technology, biotechnology, and nanotechnology around which we have built this school of engineering, and which will carry it forward," Chemers said. Chemers also acknowledged the leadership of former Chancellor M.R.C. Greenwood, now UC provost and senior vice president for academic affairs, in getting Engineering 2 built. "Without her, it would never have become a reality," he said. Other speakers at the dedication of the Engineering 2 Building were State Senator Bruce McPherson, Assemblymember John Laird, and Interim Dean of Social Sciences Michael Hutchison. They were joined by Regis Kelly, executive director of QB3, and James Demmel, chief scientist and associate director of CITRIS. Darrell Long, professor of computer science and associate dean for research and graduate studies, chaired the building committee that oversaw the Engineering 2 project and served as master of ceremonies at the dedication. He noted that the building was completed ahead of schedule and under budget. Greenwood joined retired engineer and campus benefactor Jack Baskin to dedicate the Baskin Engineering Auditorium. Baskin's gifts to the campus include the $5 million gift that established the Baskin School of Engineering and, more recently, a $1 million gift that helped fund construction of the Baskin Engineering Auditorium. 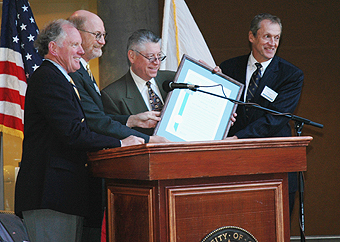 After the dedication ceremonies, the UCSC Foundation Forum took place in the new auditorium. Featured speaker Lee S. Ting, advisory director for W. R. Hambrecht and former vice president and managing director of geographic operations at Hewlett-Packard, spoke on "Innovation Leadership in the Global Economy." Ting said the high quality of education in the United States played a key role the country's past leadership in technology and will be essential if the country is to maintain that leadership position. He also said the Baskin School of Engineering is focusing its efforts in important areas for future technological development. "Going forward, we will see tremendous developments in bioinformatics, nanotechnology, and other frontier technologies, which will have significant impacts on our society," Ting said.